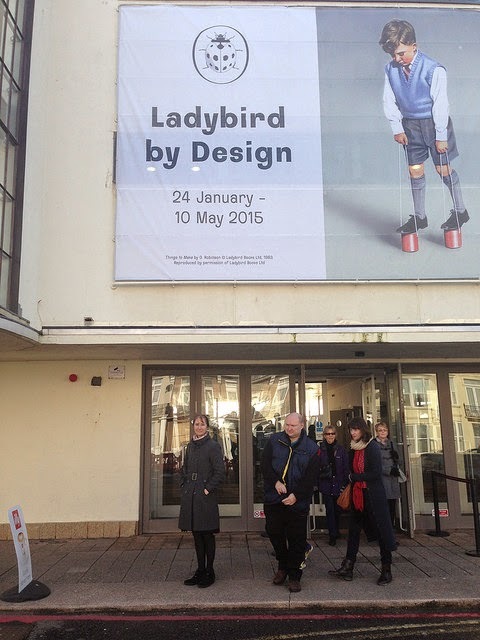 After much publicity, the Ladybird By Design exhibition opened yesterday at the De La Warr Pavilion, Bexhill-on-Sea. Me – arriving, and cold! Having provided the books for the exhibition, I’d been invited to the lunch beforehand. 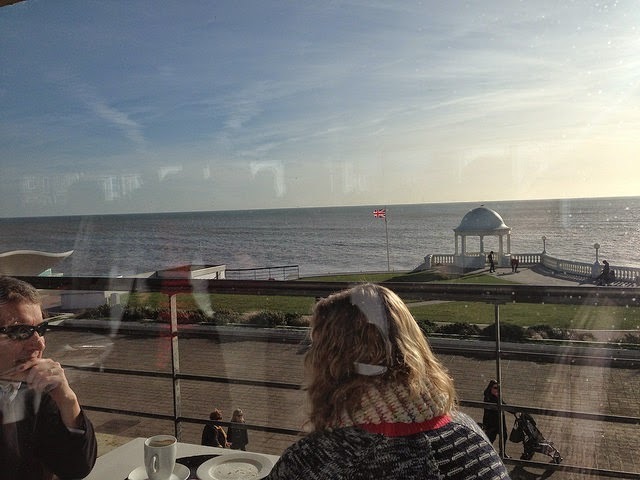 There were loads of people there – some I’d met before, others I’d wanted to meet – including the son of Key Word Reading Scheme creator William Murray, the children of wonderful artist John Berry – and lots of people I didn’t know, mainly connected with the De La Warr or the local area. 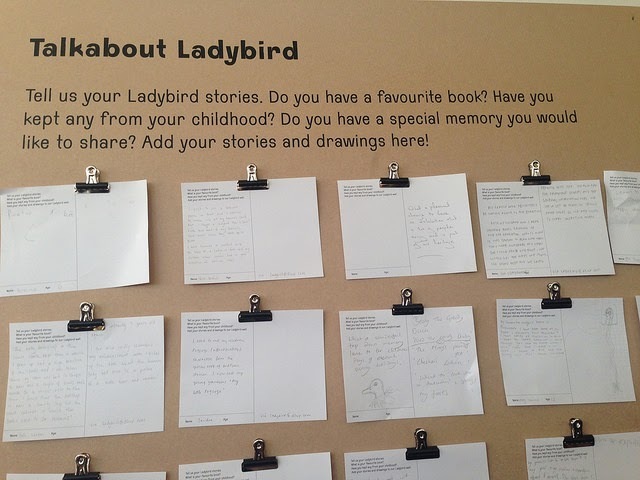 But, as always with Ladybird-related activity, everyone was likeable, warm and approachable – and the food was very good. 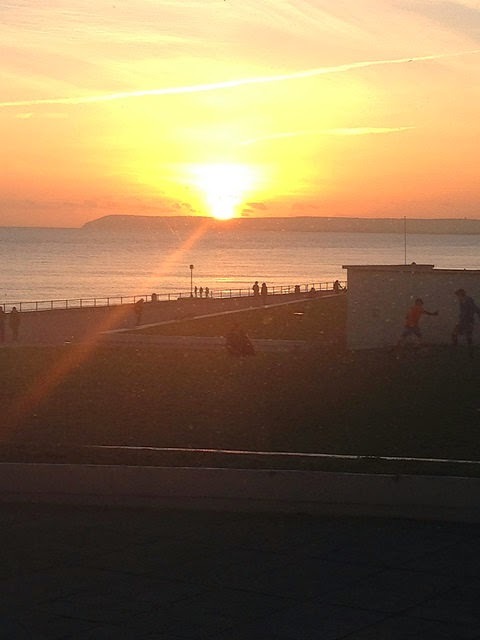 It was a superb day for it; the January sun shone in a cloudless sky and the light bounced playfully off the sea and around the rooms of the big, white building. After speeches, the hoards flocked in to see the exhibition. I think everyone was surprised by the interest that had been generated. With so many people entering the rooms at the same time it was crowded but, because there were several generously-spaced sections with plenty of exhibits on view, it was still possible to get close to the artwork and really savour it. The exhibition had been thoughtfully divided up into themed sections, a point I’m sure was entirely lost on 99% of the the visitors who were drawn from piece to piece by the vibrant colours of the artwork and the pull of deep-rooted childhood memories. 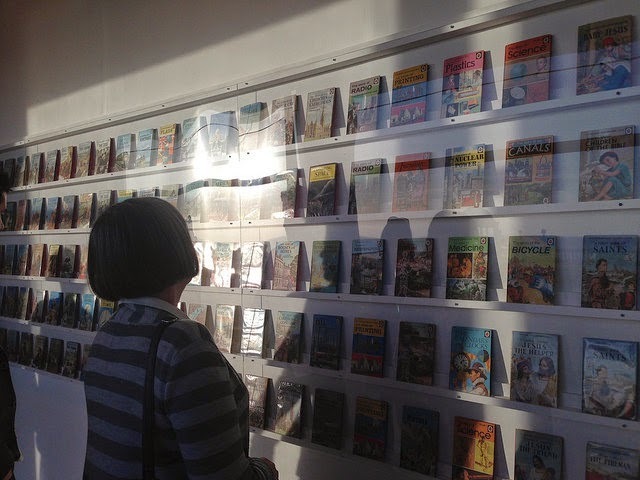 There were very few ‘artifacts’ from Ladybird history – with the notable exception of Douglas Keen’s ‘prototype books for ‘British Birds’; the exhibition was never intended as a history of Ladybird. Of course the star of the show was the original book artwork. I have seen a great amount of such artwork over the years (and have a considerable amount in my own home) but I’ve never seen such a large and wide-ranging collection of Ladybird artwork effectively displayed. Exhibits included the complete artwork from ‘Shopping with Mother’, lots from ‘Tootles the Taxi’, a few History and the pink dress (yes, the pink) from ‘Cinderella’. Pictures from the Travel Adventure series, ‘Danger Men’, People at Work, ‘Achievements’, a few Key Word Readers … many more. Then around the corner, all along a long ‘corridor’ behind the artwork were the cases filled neatly with with my books. 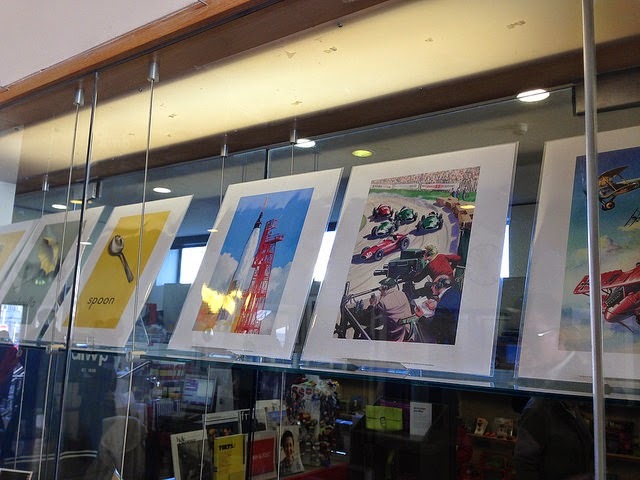 They were displayed with impressive precision and in chronological order – all beautifully spaced. It made an impression on me to see these books, so familiar and often-handled, displayed in this meticulous way. 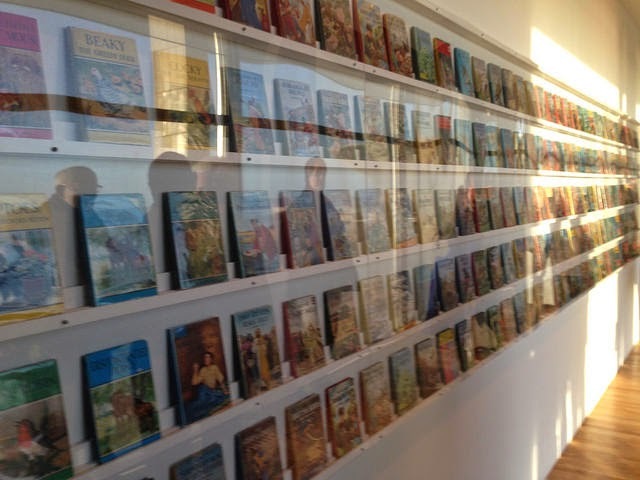 The impact was surprising and just as many people were poring over these cases of everyday books as over the unique and beautiful artwork. I listening to people reminiscing, pointing to covers they remembered, asking questions, swapping memories. Wonderful. 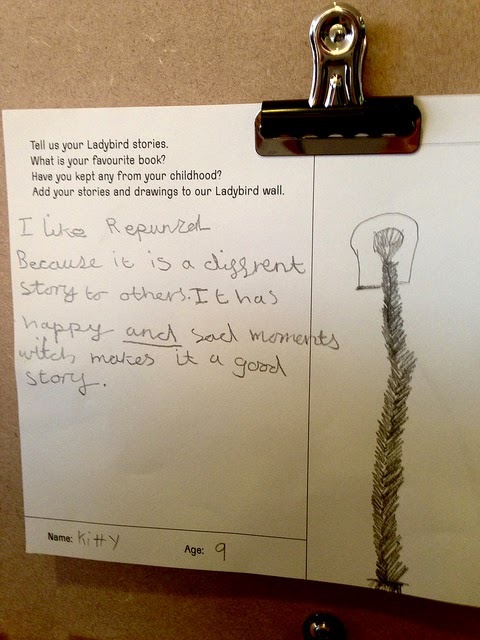 Outside again there was a ‘memories board’ and visitors, old and young, were encouraged to submit anecdotes to the ‘Talkabout Ladybird’ board or contribute via a video-clip. 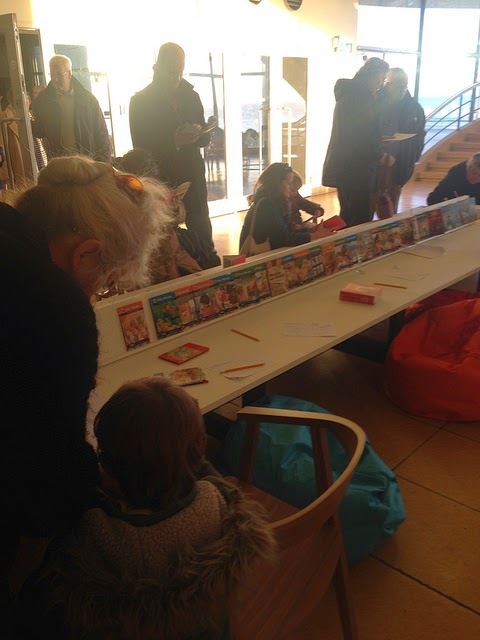 Some more of my books (along with lots of new or re-issued Penguin-Ladybird publications) were available for handling and, of course, lots of parents and grandparents were sharing well-remember books with another generation. 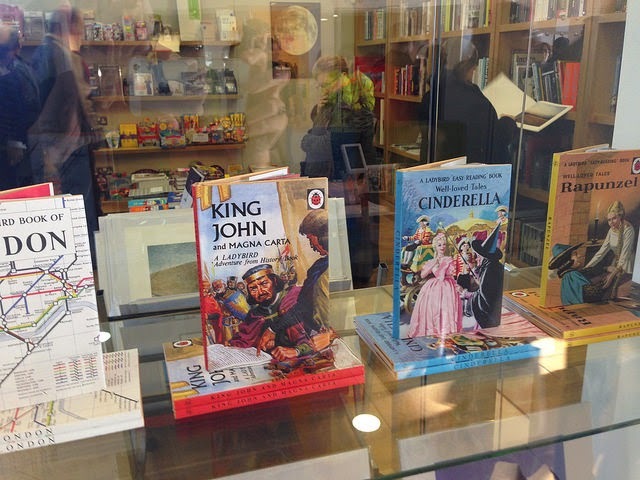 Of course, there was no shortage of nostalgia-merchandising – with the shop doing a lively trade in limited edition prints, posters, key-rings, re-issued books, cards, wrapping paper etc. if you can possibly come along on that day, please do! I have just been this weekend and enjoyed it immensely. I was especially pleased to see the annotated full size illustrations for Shopping With Mother. I had no idea that you had supplied all the books for the display. I note with interest that copies of the Uncle Mac books are fast disappearing from Abebooks. These are new to me. I'd have loved to see some of those illustrations. My mum had a large collection of ladybird books and my dad has been trying to find a worthy home for them since she died 3 yrs ago. we found a website that brought and sold but got no response. He has asked local schools but they were not interested. Any suggestions would be welcome.